﻿ Real Madrid 5-1 Elche. Cristiano Ronaldo delivers a poker of goals! 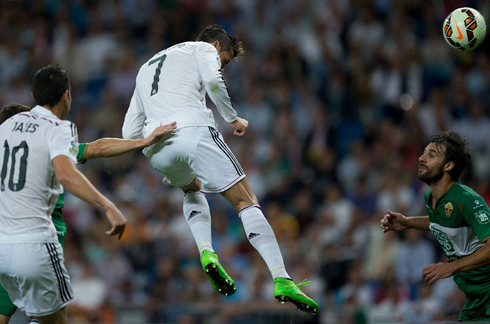 23.09.2014 » Real Madrid 5-1 Elche. 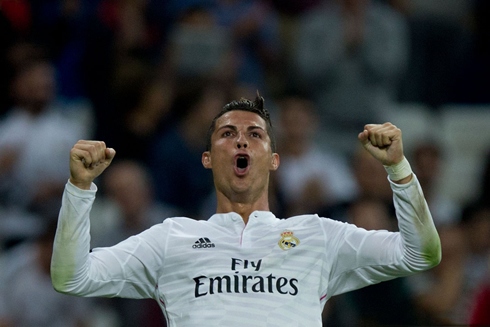 Cristiano Ronaldo delivers a poker of goals! For the third time in his career, Cristiano Ronaldo managed to score 4 goals in a single game, this time after helping Real Madrid running over Elche at the Santiago Bernabéu with a 5-1 win. The Merengues are now in a 3-game winning streak and have scored a total of 18 goals in their last 3 matches in the UEFA Champions League and La Liga. 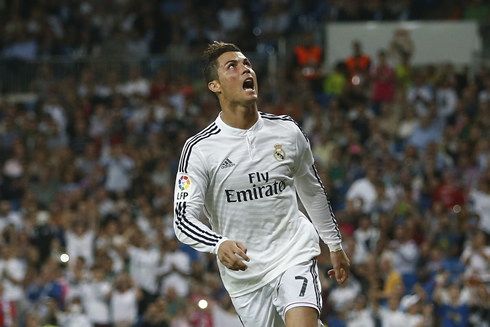 Real Madrid's hot streak continues and the European champions' last victim was Elche CF. This weak Alicante side paid a visit to the Santiago Bernabéu this Tuesday night for a mid-week La Liga fixture and they couldn't avoid leaving the Spanish capital with their bag full of goals. The Merengues had little trouble to mark their superiority and they accomplished another impressive 5-1 win mostly thanks to another stellar performance from the man of the moment, Cristiano Ronaldo. The 29-year old forward scored a poker (4 goals in a game) and showed the world once again that he's back to his best form ever. Gareth Bale also scored his 5th goal of the season when he equalized the match around the 20th minute of the first half, but the spotlight of the night was definitely meant to be turned to Ronaldo, who now has a total of 9 goals in 4 appearances in the Spanish League. Ancelotti had promised to make a few changes ahead of tonight's fixture against Elche CF and his intentions were revealed when the team's lineup came out a few minutes before the kickoff of the game. Keylor Navas finally had his chance to debut in goal and he was guarded by a back-four formed by Marcelo, Varane, Sergio Ramos and Carvajal. The biggest tactical change was brought up in midfield, with Toni Kroos and Asier Illarramendi playing together in more central areas, leaving room for Isco and James Rodríguez to play more wide. In front of them, Cristiano Ronaldo and Gareth Bale were left with enough freedom to spearhead the attack in the absence of a natural striker. Despite the comfortable numbers with which Real Madrid wrapped up the 3 points last night, things didn't exactly start as the home fans had probably wished. The visitors somehow managed to earn a penalty-kick shortly before we were through the first quarter of an hour and without having made much much to deserve it. It all happened following a corner-kick where Ronaldo knocked down an opponent with a clumsy kick, as he was trying to clear the ball away from his own box. Edu Albacar stepped up to convert it and he beat Keylor Navas to deliver Elche the first lead of the night. The visitors' joy didn't last long though and just 5 minutes later, Gareth Bale levelled things up. 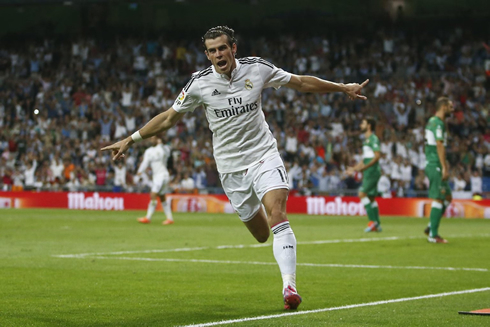 The Welshman responded with a strong header to a good cross from James Rodríguez near the left edge of Elche's box and was lucky enough to benefit from some poor goalkeeping in Elche's goal to equalize the game at 1-1. Manu Herrera could have probably done a lot better on that play, but the feeling floating in the air was that it would only be a matter of time until the hosts initiated their reaction. As for the Colombian star, it's another assist he adds up to his debut-season numbers and that might help him making a case in the inevitable comparisons that people will always tend to do between James Rodríguez and Angel Di María. After that Gareth Bale goal (his 5th for Real Madrid this season), we were on for a 1-man show at the Santiago Bernabéu. Cristiano Ronaldo delivered the first lead on the night to the Merengues near the 28th minute, after converting a penalty-kick controversially drawn by Marcelo. The Brazilian left-back seems to have fallen inside Elche's box at the slightest touch, but Ronaldo surely didn't let that thought trouble him in the decisive moment and gave absolutely no chance for the visitors' goalkeeper to stop his shot. The hosts' lead went to 3-1 shortly after, when a cross from Marcelo coming from the left found Cristiano Ronaldo escaping his marking inside the box and in a great position to attempt hitting the target with a header. Just like he had done it last weekend against Deportivo, CR7 showed his all-round game when he headed the ball into the back of the net with a super header, allowing Real Madrid to go into half-time with a 2-goal cushion. We had to wait until the 80th minute to watch another goal in this game and it would come from a third penalty-kick call by Clos Gómez, the referee appointed to this match. Ronaldo was basically tripped from behind when he was already running inside Elche's box with a defender on his back and which ultimately allowed him to draw the 2nd penalty of the night for the hosts. The former Manchester United player completed his hat-trick with another faultless strike from the 12-yards mark and put the score on a 4-1 favorable to the Merengues. The final result was only established after we stepped into stoppage time, in an attacking play initiated by Gareth Bale near the midfield line. The former Tottenham star brilliantly disposed a defender with a great 1-touch dribble, just before he delivered a perfect assist to Cristiano Ronaldo, by granting his teammate a clear opportunity to go face to face against Elche's goalkeeper. The Portuguese ace didn't waste his chance and by using the outside part of his boot, he easily struck the ball past Herrera, completing his 4-goal poker and setting the final score at 5-1 to Real Madrid. 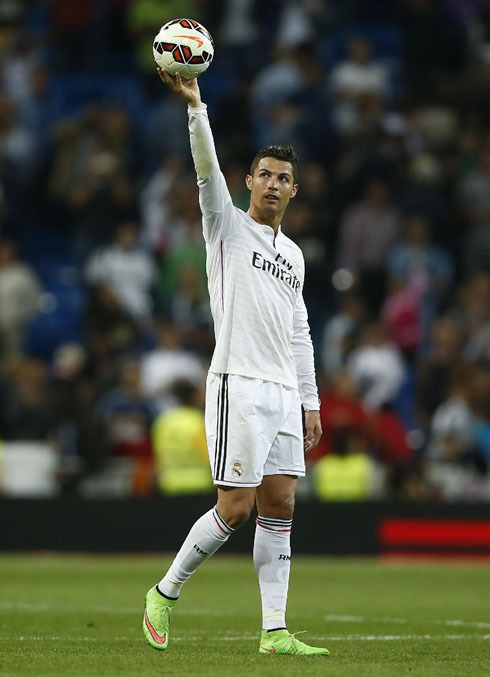 • Cristiano Ronaldo scores his 6th, 7th, 8th and 9th league goal in the season. 4 Appearances 9 Goals. • Cristiano Ronaldo has now scored in 13 consecutive La Liga home matches (total of 22 goals). • Cristiano Ronaldo is the 1st Real Madrid player to score in 13 consecutive home matches in La Liga history. • Cristiano Ronaldo has now scored 12 goals in 8 appearances this season. • Cristiano Ronaldo has now scored 21 hat-tricks in La Liga, only one away from Zarra and Di Stefano (22). • Cristiano Ronaldo reaches his 28th career hat-trick. • Cristiano Ronaldo scores consecutive hat-tricks for the 2nd time in his career. • Cristiano Ronaldo scores a poker (4 goals) for the 3rd time in his career. • Cristiano Ronaldo has now scored 186 La Liga goals in 169 appearances. • Cristiano Ronaldo has scored 7 goals in a space of 4 days. • No other player has scored more goals than Cristiano Ronaldo (9) in Europe's top 5 leagues this season so far. • Cristiano Ronaldo (7) has scored more goals than Barcelona (6) in their last two matches. • Cristiano Ronaldo (9) has scored more goals alone than 17 of the 19 teams in La Liga this season. Cristiano Ronaldo next game for Real Madrid is against Villarreal, in the 6th fixture of La Liga, on September 27 (Saturday). In the meantime, you can watch Villarreal vs Real Madrid, Malaga vs Barça, Manchester City vs Sheffield Wednesday, Chelsea vs Bolton, and Borussia Dortmund vs Stuttgart, all matches provided from our live soccer pages.